(DoT): The winners of the Cayman Islands Department of Tourism (DOT) short film competition entitled Cayman…Through My Eyes were announced recently, during a special screening and awards ceremony held at the Harquail Theatre. Junior winner Jessica Johnson earned a one week scholarship for the Introductory Digital Filmmaking Camp for Tweens at the New York Film Academy and a Nikon Coolpix P500 Digital Video Camera. First place senior winner Gerome also earned a one week scholarship to the New York Film Academy for the Digital Filmmaking Camp and a Nikon Coolpix P500 Digital Video Camera. Following an online voting process, Joshua was recognised as the People’s Choice Award winner. Acting Director of Tourism Shomari Scott lauded the budding filmmakers. “It is always refreshing to be reminded that the Caymankind spirit resides in all of us here, regardless of our age. These young stars have demonstrated an awareness of our culture, environment and what it really means to be a part of the Cayman Islands and I believe that competitions like this help to encourage our youth to develop into ambassadors of Cayman,” he said. Photo: Winners of the Short Film Competition flank staff from DOT after being presented with awards. 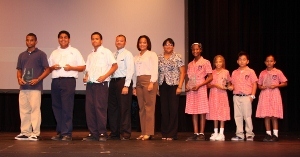 Pictured are (L to R) Gerome Bodden, Daniel Conolly-Foster, Joshua Smith, Kyle McLean, Raquel Brown, Diane Conolly, Jessica Johnson, Jasmine Ebanks and Sky Celestial, and Carey Ebanks.